Mummy-Me are enemies that appear to resemble mummified Toads. They made their debut in the Wii U title Captain Toad: Treasure Tracker as enemies who follow Captain Toad or Toadette in certain levels. At first, a single Mummy-Me appears by following them; however, as they proceed onwards to additional levels, more Mummy-Me start spawning. As they spawn, they form a black cloud that follows the player; once it forms, it shouts "mummify!," similar to how Captain Toad or Toadette shout "multiply!" when obtaining a Double Cherry. Captain Toad or Toadette can defeat them by using a Super Pickax, and they give three coins upon defeat. 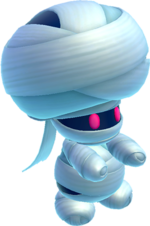 Mummy-Me appear to behave similar to the Cosmic Clone enemies that first appeared in Super Mario Galaxy 2. Manemī From mane (imitate) and "mummy"
This page was last edited on November 23, 2018, at 09:58.